Growing up Jake thought his Grandpa Portman was the most fascinating man in the world. He loved to hear his grandfather’s stories about life in the Welsh orphanage where he had been sent as a boy to escape the Nazis. Grandpa Portman mesmerized Jake with tales of his childhood friends and their peculiar gifts. One could hold fire in her hand. Another could levitate. Another was invisible. Still another had amazing strength. To add to the intrigue, there were photographs, strange and haunting photographs, of these children displaying their unusual gifts. But as time passed and Jake grew older, he began to realize that these stories and even the photographs were too fantastic to be true. In time, Jake came to see them as merely a kind of family fairytale – that is, until the night that everything changed. When Jake’s grandfather is attacked in the woods behind his home, the police blame wild dogs. But Jake was there, and he saw the attacker. He was no dog. He was terrifying. And he was right out of one of Grandpa Portman’s stories. Unfortunately for Jake, no one believes him – just like no one believed Grandpa Portman. To confront the nightmares and fears that consume Jake’s life, his parents try therapy, drugs, and distractions. Eventually Jake tries to convince them to let him travel, with his father, to Wales to see if he can find out more about Grandpa Portman and the place where his strange stories originated. Reluctantly they agree, hoping it will put to rest Jake’s belief in the truth of these tales. However, there on the island of Cairnhom, Jake finds Miss Peregrine’s orphanage, old and decaying, but teeming with information. Digging through rubble and remains of the old house, Jake begins to uncover, artifacts, photographs, and the dark secrets of Grandpa Portman’s strange and disturbing childhood and the orphans he shared it with. Set in a quaint Welsh fishing village and in the fog-shrouded Welsh countryside, this novel, part mystery part horror story, takes us with Jake on his this quest. Who were these children his Grandfather grew up with? Were their gifts real or just fantastic stories? What happened to them? And where are they now? 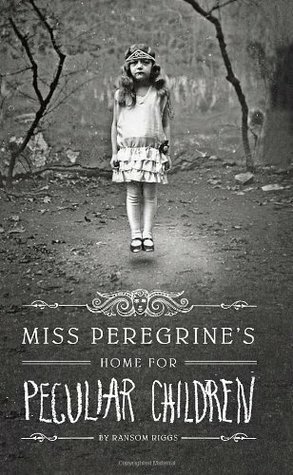 As intriguing as this story is, Miss Peregrine’s Home for Peculiar Children might not be the book for everyone. I’ll admit that I half hoped the story would turn out to be a mystery of the ordinary variety. But no. Miss Peregrine’s Home for Peculiar Children is definitely an extraordinary story. However for adults and teens who enjoy the strange and the scary, this book is a nice departure from the witches, vampires, ghosts, and werewolves that we see in so many YA novels. The children, although very peculiar, are just children, some darker and creepier than others, but they are not supernatural nor other-worldly. There are monsters in this story, but they former Peculiars whose own attempts at immortality caused their mutation. Another refreshing thing about this book was the lack of steamy romance. There is an emerging romance between Jake and one of the teenage orphans (yep, they’re still there), but this is not necessarily central to the plot. Unlike most YA fantasy novels where the sexually-charged relationship between some misfit human and some ultra cool vampire, ghost, or witch is the storyline, in this book the romance is more of a subplot. Like so many YA novels today, this one is the first in a series. So, it looks like fans will have to read the next novel, The Hollow City, to see if Jake’s romance is taken to the next level. In fact, we’ll have to read on because at the end of the Miss Peregrine Jake’s adventure is really just beginning. Yes, there are some swear words in this book and some crass expressions. Yes. Jake and the other orphans must battle the monsters who threaten their safely. The last 40 pages or so involve a pretty intense battle between the opposing sides. Not really. As I said, neither the peculiar children nor the monsters they fight are really other-worldly. But the monsters are scary and some of the children are downright disturbing. To give you some idea of the type of book this is, Tim Burton will be directing the movie slated to come out in the Summer of 2015. Check out this article and creepy book trailer. To add to the eerie factor, this book is filled with photographs of the Peculiar Children – holding fire, levitating, swarmed by bees, etc. The creepy thing is that all the photos in the book are actual photos found in various flea markets, antique shops, and private collections. Chilling. Due to language and crass expressions some parents might feel this book is not suitable for tweens and younger teens.